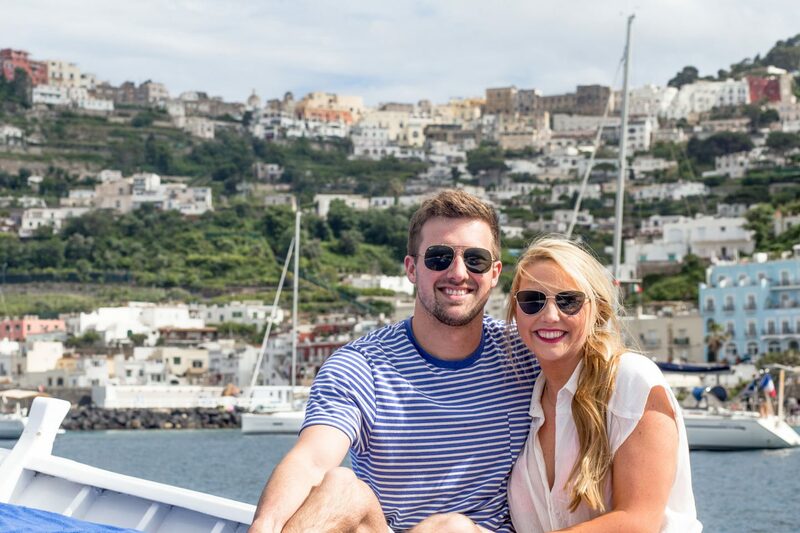 As soon as Logan and I booked our flights to Europe (without much of a plan), I started seeing photos all over Pinterest and Instagram of Capri & the Amalfi Coast. Without much convincing, I told Logan we had to add these colorful cities and bright blue water to our list. 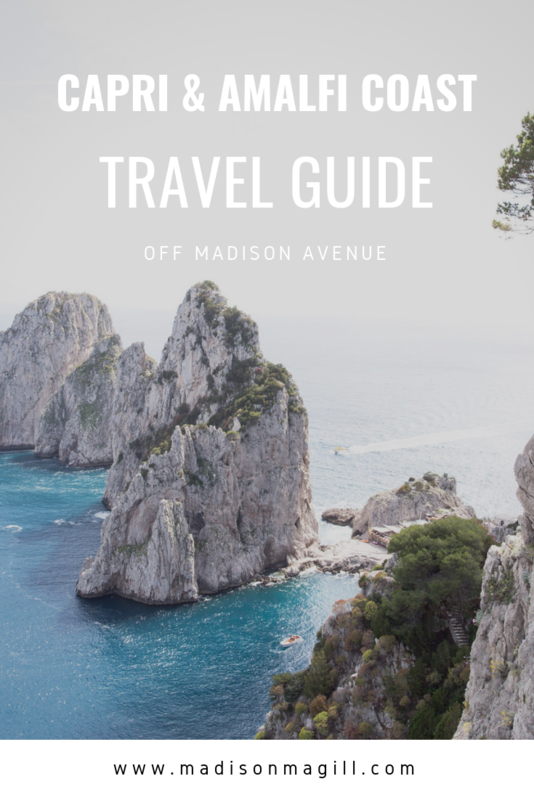 When planning the trip, the most difficult thing that I encountered was exactly how to get to Capri & the Amalfi Coast. After a lot of digging, we decided to fly into the Naples airport. From there, we took a taxi to the Ferry station, and then a 45 minute ferry ride to Capri! The ferry is quick, and it runs often. You can find the ferry schedule here. 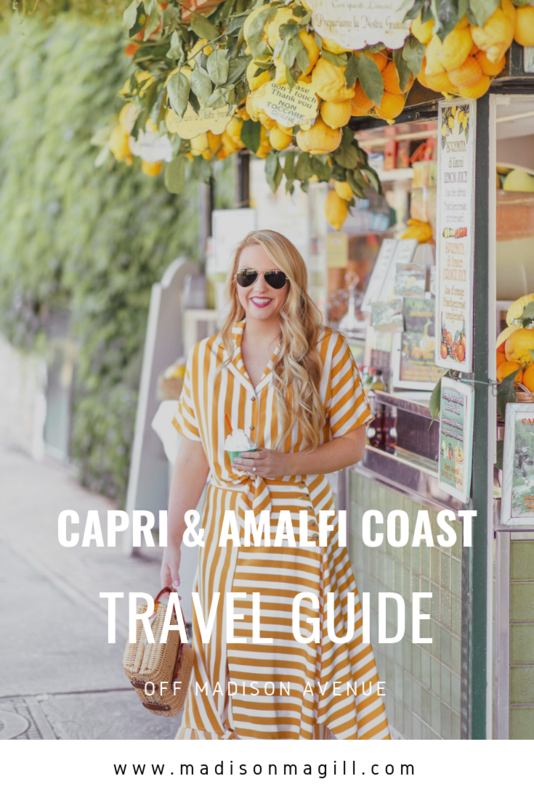 We decided to make Capri our “home base” and travel to the Amalfi Coast for a day trip! Capri and Amalfi Coast is truly one of the most picturesque places I have ever been. Everywhere we turned, we felt the views were worthy of being framed on a wall somewhere in our home. 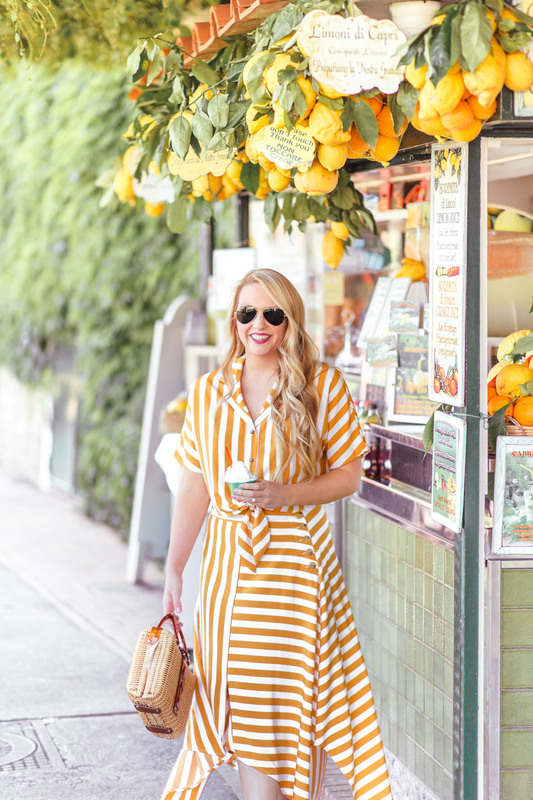 I am so excited to finally share photos and a video of our trip, as well as things to do in Capri! 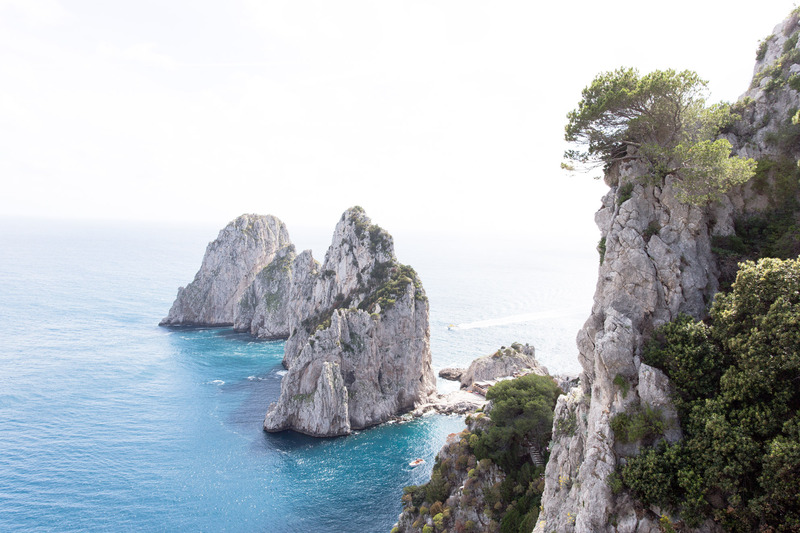 If you are traveling to the the coast of Italy soon, make a trip to Capri & the Amalfi Coast and send me pictures! 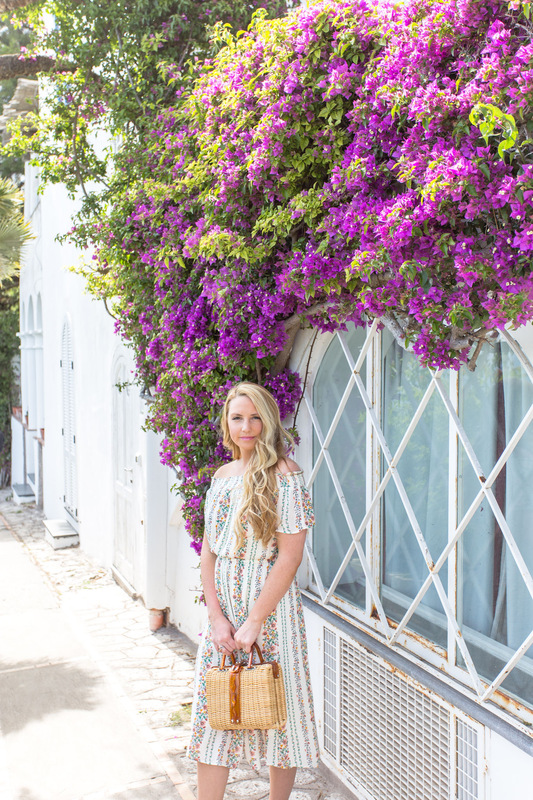 Visit the Gardens of Augustus: The Gardens of Augustus was one of the first things that we did when we arrived in Capri! We started here before taking our walk around the Island. These botanical garden are located near the center of Capri. They have the most beautiful views of the bright blue water! 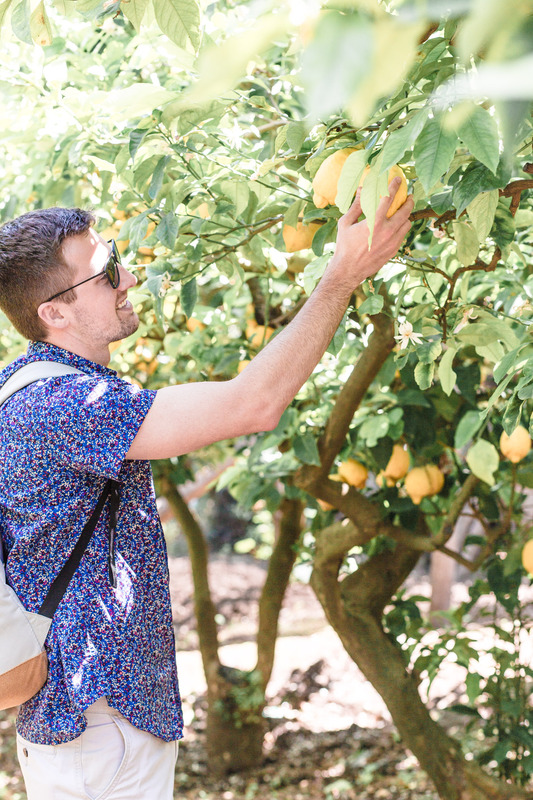 Eat lemon gelato: I am sure you have seen large amounts of lemons associated with all things Capri. 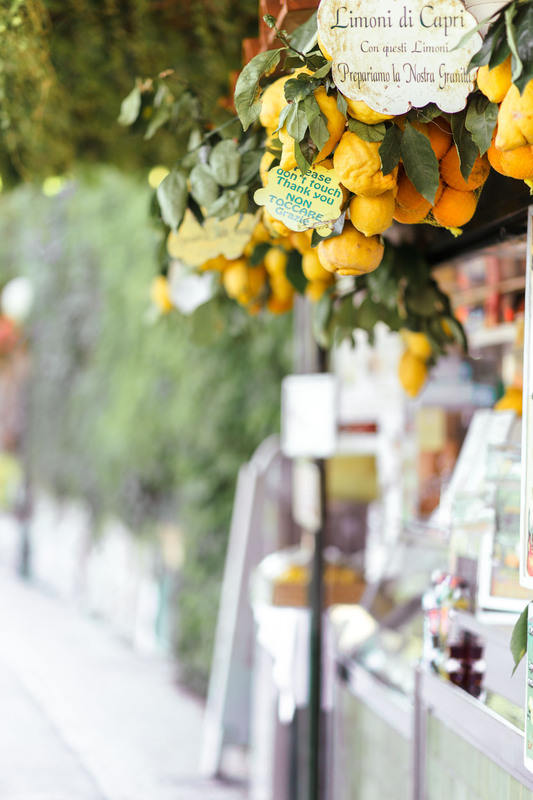 We visited the famous Limoni Di Capri for truly the best lemon gelato I have ever had. Lemon gelato is my absolute favorite, so this might have been more exciting for me than others. 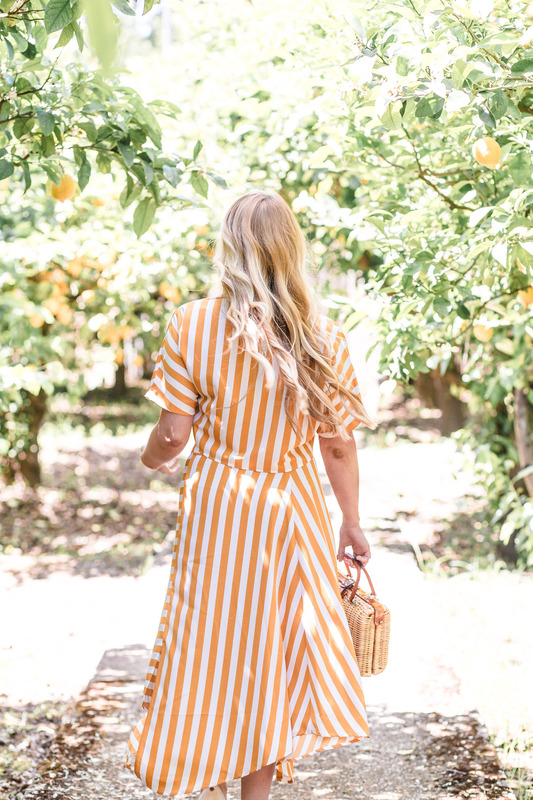 I also could not pass up the picture perfect little lemon stand situated perfectly in the Gardens of Augustus. 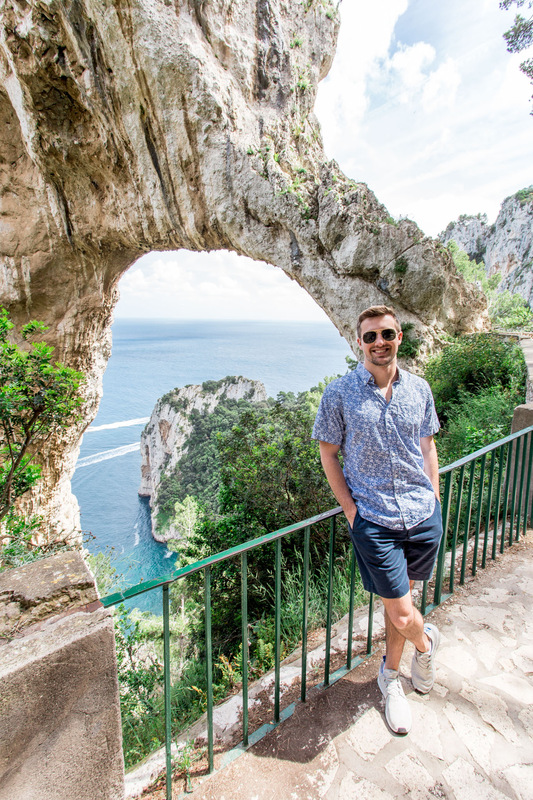 A walk to Tragara, Arco Naturale & Faraglioni: Honestly, I was dreading this 3 mile walk around Capri, but the views were worth ever step. Thankfully, I have a husband who loves to explore, and he convinced me that we had to go. All of the photos below (showing the Arco Naturale and Faraglioni) were taken on our walk! 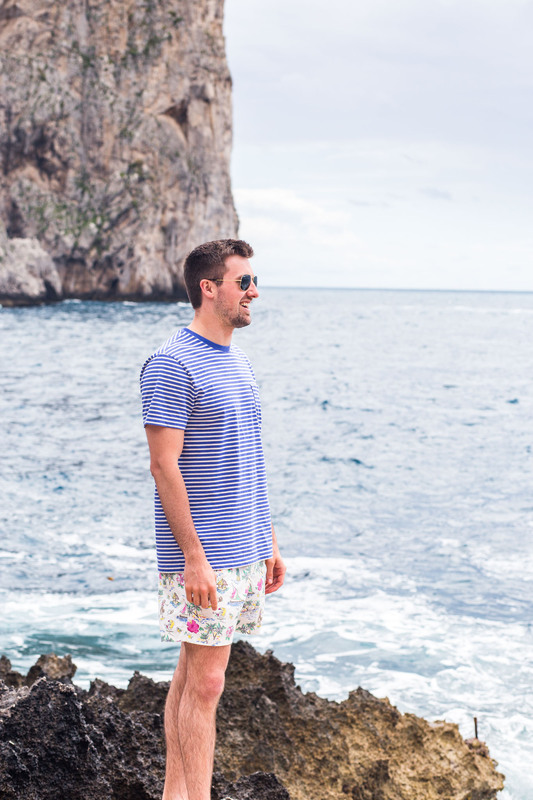 It was the first thing that we did when we arrived in Capri, and it was honestly so helpful. It allowed us to have a basic understanding of where everything was in Capri as we continued to explore over the next few days. Eat a lot of pasta & pizza: I mean, is this a given? I truly did not eat a single meal that didnt include carbs our entire two week in Europe. I was not disappointed at all! 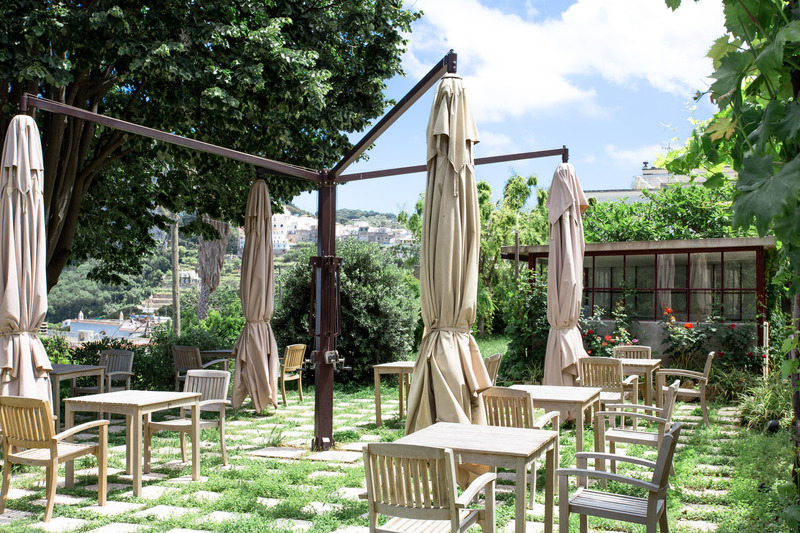 We ate a hand full of restaurants, but are favorites were the Capri Rooftop, Ristorante Terrazza, and Ristorante Panaroma. The Capri Rooftop had the best cocktails and prettiest view, and is a must when visiting Capri. You can see it a little bit of the view in the video at the end of this post at 2:10! 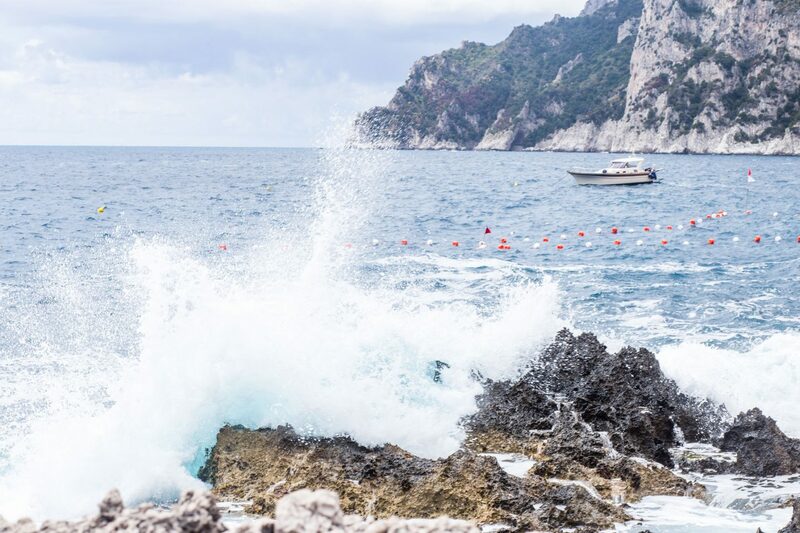 Take a private boat tour: This is one of the best ways to see the whole entire Island of Capri, and so romantic. Because of the price, Logan and I wrestled with the idea of doing a group tour, or a private tour. However, I am so glad that we decided to take the private route! We booked with Gianni’s Boats and they picked us up after an afternoon at the private beach, La Fontelina. They took us around the island, showed us the grottos, we toasted with limoncello, and they dropped us back off at the main port close to our hotel! 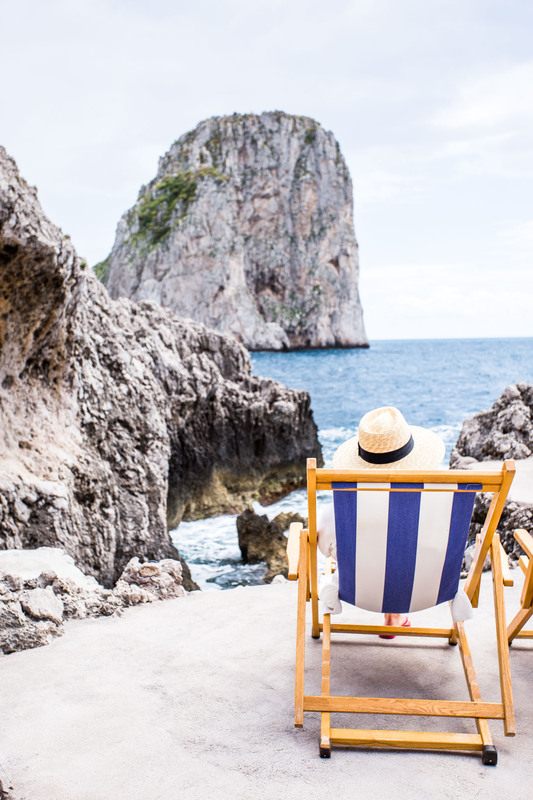 This was definitely a splurge worthy activity in Capri. Explore the Grottos: We were able to visit the Grottos on our private tour with Gianni’s Boat. However, because of the rough waters that day, we were not able to actually go into them. However, if the weather permits, you can visit the Grottos on both a private tour or a group tour. You have to get out of your boat, and into a smaller one for your tour into the Blue Grotto! Visiting inside the Blue Grotto is also an additional fee on top of the boat tour. You can only get to La Fontelina by foot, or taking a boat. Logan and I decided to walk, as it was pretty close to our hotel. This was perfect because we were able to lay out, enjoy the view, and only share it with a few other people. Thankfully, I discovered La Fontelina before we left and I was able to add it to our itinerary! You have to email them 24-48 hours in advance to rent a chair. When you rent a chair, it also gets you a reservation at their private restaurant. They had hands down the freshest Caprese salad I have ever had in my life. You can make a reservation by emailing them here. Our private boat tour picked us up at the dock at La Fontelina, took us on our tour, and then dropped us off at the main dock close to our hotel. This ended up working up, much better than I could have planned, because it saved us a walk back! 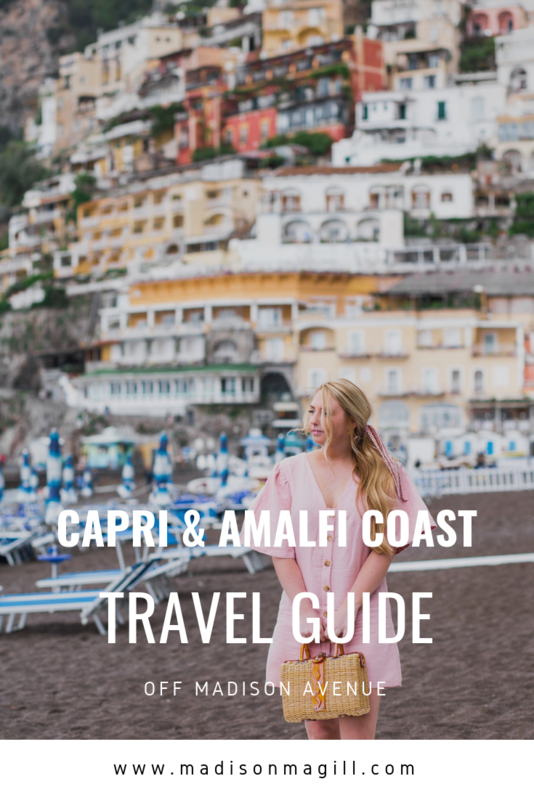 Take a day trip to the Amalfi Coast: When deciding our trip to Capri and Amalfi Coast, it made the most sense to make one of these our “home base” and travel to the others with all the luggage we had for our entire two week trip. Logan and I decided to stay in Capri because it was in between Naples (where we flew into) and the Amalfi Coast. We had planned to visit Positano on the second day in Capri, and got bad weather and sadly our Ferry was cancelled. We made plans to go the next day, and while the weather was still terrible, our Ferry was in service! After a little bit of sea sickness, and a whole lot of rain, we took a 30 min Ferry ride to Positano from Capri. Without the bad weather, I can imagine this is a quick, easy and painless trip! You can book your tickets in advance here. 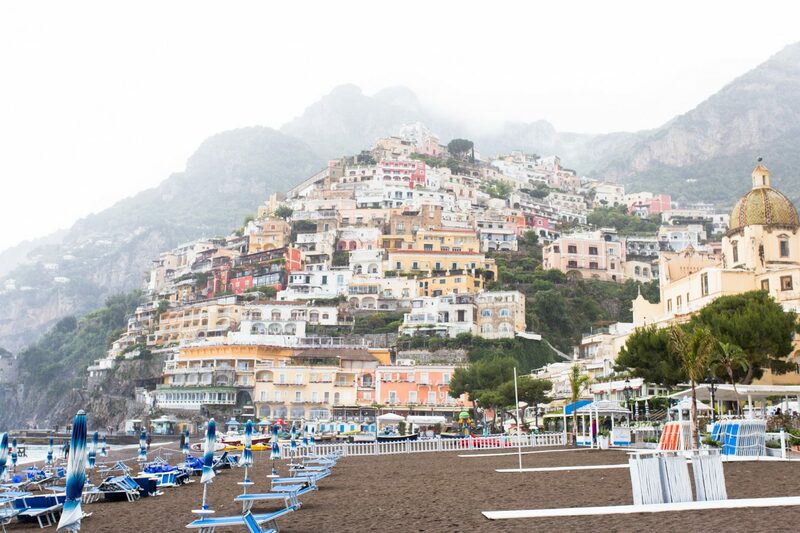 When we arrived in Positano, we did not have much time to explore because of the weather delays. But, we were so happy that we were able to see the colorful mountain side. 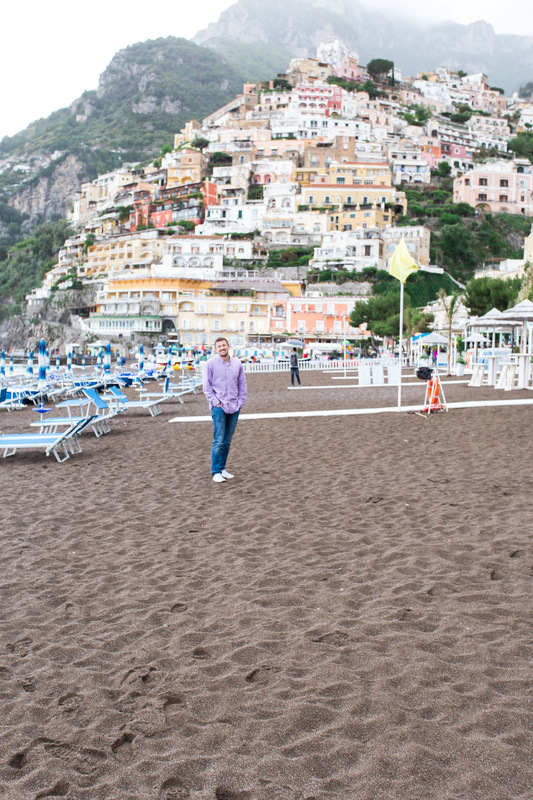 Positano had a beautiful beach that would have been perfect for laying out, if weather permitted! Logan and I walked around (in the pouring rain) and enjoyed pizza with the few hours we had in Positano. I am so happy that we were able to make the trip despite the weather. But, we will definitely be back to get the full experience! Traveling the world with Logan is truly one of the most incredible things. 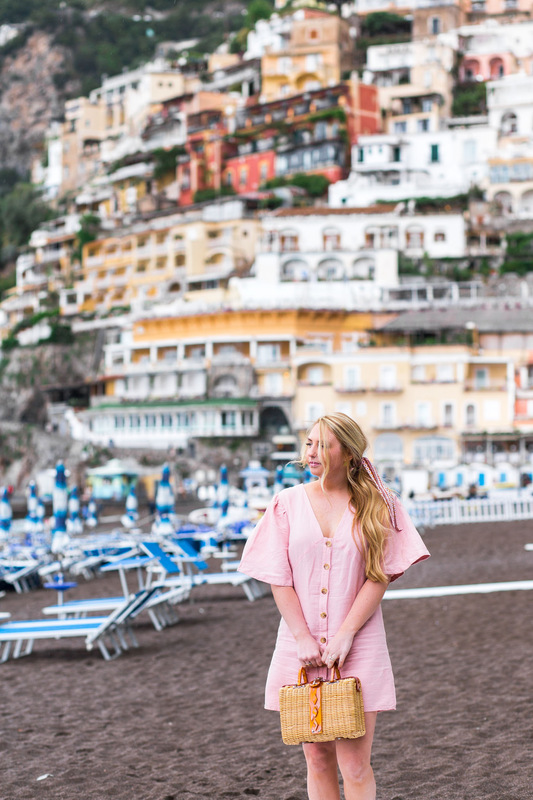 I cannot wait to cross more countries off of our bucket list, and visit Capri & the Amalfi Coast again one day! So helpful! Gorgeous photos! I may have more questions and might message you on the gram! We are just now planning our trip and we are going in October! Aw so fun Emily! Please send me any messages, I would love to help! You will have the best time!